This rainforest, volcanoes, and beach itinerary offers a great combination of relaxation, adventure and romantic memories. This package starts with 2 nights at the beautiful, peaceful El Silencio Lodge located in a peaceful cloud forest just one hour from the airport. Enjoy a mystical hiking tour to the beautiful waterfalls. Continue your exciting trip with 2 nights at the amazing Arenal Volcano where you will relax at the hot springs and Hotel Arenal Naraya. 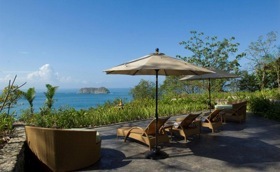 End this unique occasion with 3 nights at the cozy Arenas del Mar hotel located at one of Costa Rica´s most beautiful beaches and National Parks, Manuel Antonio. 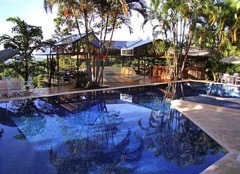 Also included is an overnight at the lovely Vista del Valle Plantation. Upon arrival to international airport, our guide/driver will pick you up and will forward all documentation for your romantic honeymoon vacations. He will then drive you to the beautiful El Silencio Lodge located around 1 hour from International Airport in the rural area of Bajos del Toro Community. El Silencio Lodge is a planet-friendly sanctuary for soft adventure and inspired wellness. Silencio, Spanish word for Silence, if befitting of a destination where daily stress is hushed and the sounds of nature bloom. Explore and enjoy five hundred acres of carbon-offsetting of tropical cloud forest in Costa Rica’s crisp Central Volcanic Region. 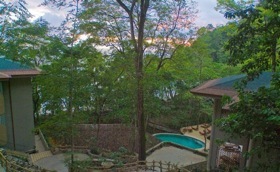 El Silencio Lodge and Spa offers 16 luxury suites with river or cloud forest vistas. Each features a private viewing deck and whirpool , gas fireplace, complimentary minibar, and premium amenities including Loccitane personal care products. 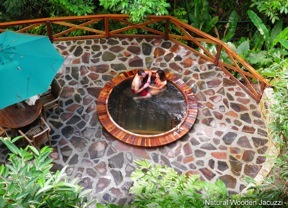 Highlights: Hidden waterfalls, 500 acre private cloud forest reserve, private whirpool tub and fireplace, hiking trails, Spa and Yoga, horseback riding, Poas Volcano, 20 minutes, Sarchi Arts and Crafts 30 minutes away. Breakfast included. 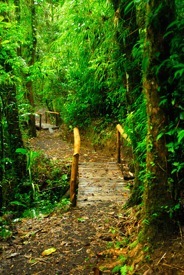 Today you will have a mystical guided hiking tour to the beautiful waterfalls within the property. Enjoy a welcome cocktail and plate of chocolate covered straberies. Dinners will be offered during your stay. 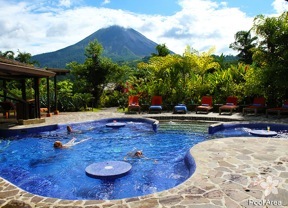 Located in the outskirts of the Arenal Volcano, Arenal Nayara Hotel & Gardens provides a uniquely natural experience. 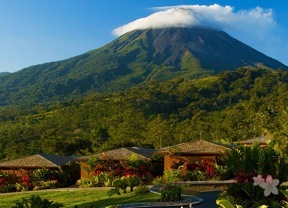 Surrounded by lush tropical rainforest, each one of its 24 spacious casitas provides an exclusive retreat in which guests can relax amidst the breathtaking view of the volcano. The hotel’s deluxe tropical architecture mirrors the beauty of Costa Rica’s natural wonders and gives the opportunity to enjoy the best of the authentic Costa Rica hospitality. 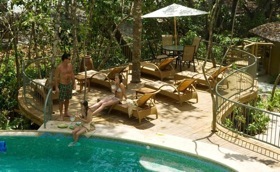 Interwoven with rich gardens its tropical grounds create the perfect setting to rest and enjoy nature. 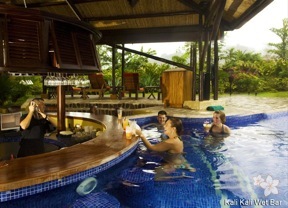 A large Jacuzzi and wet bar provide a place to rest after enjoying the various guided activities, including white water rafting, hiking, mountain biking, volcano treks, and hot springs. Arenal Nayara Hotel & Gardens offers a full service restaurant, where local ingredients blend with a world-class cuisine to provide an incomparable dining experience. 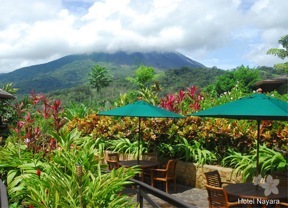 The restaurant is open for breakfast, lunch and dinner and boasts a direct view of the active volcano. Today you will have a full day tour which starts with the visit to the Arenal Hanging Bridges, La Fortuna Waterfall, a hiking tour at the park and later a visit to Eco Termales where you will enjoy 3 relaxing hours at the hot springs. Lunch and dinner included. Back to your hotel for dinner and overnight. minibar, and large terraces complement the room offerings. Guest rooms are designed to offer comfort and luxury while taking into consideration the surrounding environment. The buildings housing the guest rooms were altered to fit around existing trees, water is heated with solar panels and grey water is reused for irrigation. The private hot tub on the deck of the Apartment is ideal to relax and observe spectacular Pacific sunsets. Arenas Del Mar Beach and Nature Resort features two gourmet restaurants showcasing the use of seasonal and local ingredients featuring Costa Rican cuisine with an international flavor. El Mirador promises incredible fresh seafood and gorgeous views over the Espadilla Beach with its white sand beaches and the sparkling Pacific Ocean. At the El Mirador Bar, be sure to try Costa Rican specialty drinks such as horchata, organic shade grown coffee, and let the sommelier help you to discover fine wines from Argentina and Chile. 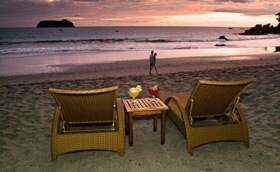 visiting Manuel Antonio National Park or just relax at the private beach and beautiful scenery. and relaxing massages while being lulled by the sounds of the sea and the breezes flowing through Las Brisas Spa. Explore the natural flora and fauna in this incredible rainforest setting. Take an excursion and explore the jungles with its howler, white-faced, and squirrel monkeys, sloths, crabs, among other forms of exotic wildlife. 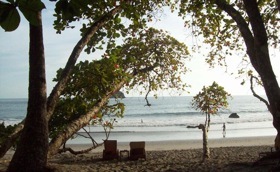 Explore Manuel Antonio, one of the most famous and smallest National Parks in Costa Rica. For the adrenaline junkie, there is white water rafting. Take surfing lessons and go horseback riding or birdwatching. 20 minutes west of the international airport with spectacular views of the central valley. 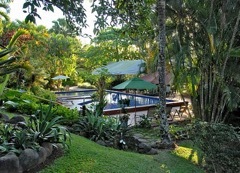 Vista Del Valle Plantation Inn is the perfect place to start and finish your Costa Rica vacation. Each guest room has its own balcony with scenic views. The cottages of the Vista Del Valle Plantation Inn have all of the amenities of home in very private and beautiful settings. Trails lead through the gardens, plantation, and through the nature preserve, and to a 300 foot (100m) waterfall. Watch the birds, read a book, hike, go horseback riding, do some laps in the pool, soak in the Jacuzzi, or just relax in the hammock in front of the room. Breakfast. Free morning to enjoy the hotel´s facilities. Transportation to International airport according to your flight departure. hotels have been selected by different world-wide travelling authorities to be among the most romantic hotels in the world, and some of the best hotels in the world. We carefully design a selection of Romantic Getaways according to your length of stay and expectations. Let us pamper you with spectacular mountain and ocean view retreats, great combination of activities, world-class facilities, and services.